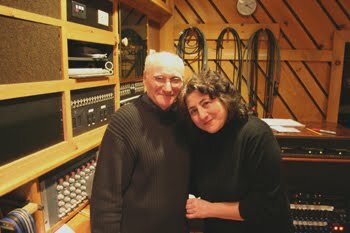 Malcolm Addey came in to record Nanette Natal on February 11, 2011. He used live to 2-track to analog 1/4" tape to record her and her band in Studio B. Malcolm and Nanette were kind enough to allow us to share how their session was recorded. The instrumentation was electric upright bass (sometimes known as a pogo stick), drums (drummer also played bongos and bell tree), electric doubling acoustic guitar, and Nanette who also played acoustic guitar and sang vocals. The session layout in Studio B is shown here. I asked Malcolm a few questions about the live to 2-track recording method. 1. What is a live to 2-track session (definition)? The actual real time mix of the live performance is stored onto the 2-track medium of choice with no possibility of further post session remixing. Although the mix is final, however, corrections are possible by editing. Live to 2-track stereo (except for mono) was the only recording method available before the advent of multiple track recording using 3 or more tracks. The introduction of which increased recording budgets enormously because of tape cost, extensive use of studio time and the ability for performers to overdub and remix ad infinitum. 2. What preparation / setup do you like to use for this type of session? The acoustic isolation on instruments or vocalists essential on a multi track session is obviously not such a consideration as on a live 2-track date. Therefore I am able to place the musicians much closer to each other. Sometimes this obviates the necessity of using headphones - a situation I always prefer as musicians play much more naturally when they can hear themselves acoustically in the same room. All situations are different, of course, and my decisions would be based upon, among other things, the type of music involved, the studio space and the comfort of the musicians themselves. 3. When is live to 2-track a good option? There is something exciting and immediate about this form of recording not enjoyed in multiple track techniques which rather tend to produce a "we can overdub that" or "we can fix it in the mix" mentality. But, of course, this is the only option when the multiple track technology is an integral part of the creative process as in pop and rock. Essential ingredients to success are an engineer who has much experience in this form of recording and a producer with a full understanding of both the limitations and advantages of direct to stereo. 4. What are some (notable) examples of a live to 2-track session (that you worked on)? A difficult question. I would estimate that about a third to half of my working life's output of more than 50 years was recorded in this format. I do not subscribe to the view that a given recording's association with super star names is any measurement of that recording's note. Too subjective and for others to judge. 5. Do you have a favorite live to 2-track session story you would like to share? Not specifically but the most common is the reaction when a performer who asks to "punch in" something is told it is not possible! 6. Was there something special or different about the way you engineered the Nanette Natal session in Studio B? Nanette likes the warmth and natural dynamics of the sound I produce for her. Contributing to that, I'm sure, is my choice and placement of microphones and avoidance of EQ. As mentioned above the musicians are placed as comfortably close to each other as possible with minimal use of screens. Nanette herself stands freely among them and not in a booth. 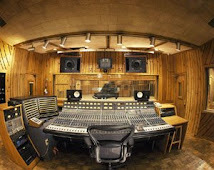 Avatar's Studio B is the perfect room for her and if one listens carefully, the sound of the room can clearly be heard. In no small measure is this due to the lack of need for acoustical isolation. One final point. 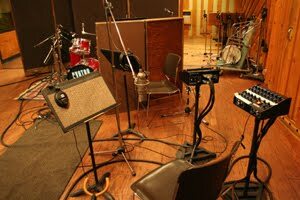 Direct to 2-track stereo recording is not to be confused with stereo recording with only two microphones. That is an entirely different subject! You can watch and listen to a short clip from their recording session. Malcolm Addey was assisted by Avatar’s Aki Nishimura.